This week, we’d like to help a 7 year old boy from Leeds called Leon. 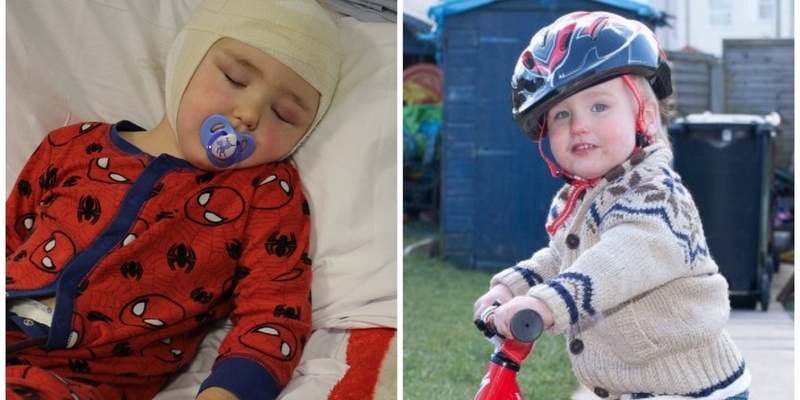 Just after his second birthday, Leon was diagnosed with multi suture craniosynostosis. It is a condition where the joints in a baby’s skull fuse too early, which causes problems with brain growth and head shape. He had surgery to rebuild his skull when he was 3, and when he was 4 he was diagnosed with epilepsy. He has seizures day and night. Leon also has autism, sensory issues and is delayed in his development. He has been in and out of hospital for his entire life. Leon was home-schooled until January of this year, when he joined the same primary school as 2 of his sisters. He now attends 3 days a week with full support, which is an incredible achievement for him. Sam is his full-time carer, but on top of caring for Leon and his siblings, she has her own challenges to face. Sam had a spinal chord injury and had surgery last year. It has left her with very little feeling in her hands and weakness down her left side. So Leon’s dad, Mark, juggles work, school runs and helping to care for Leon and his brothers and sisters. They live in a council home which they would desperately love to renovate. Leon currently sleeps in his parent’s room, as at the moment it is the safest place for him to be. But they would like him to start sharing a bedroom with his big brother. As it is, the room wouldn’t be safe for Leon. The room needs redecorating, custom bunk beds built (no sharp corners, low to the floor), blinds for the windows, fitted wardrobes to make optimum use of the small space, and some toy storage. Mark has the skills and determination to do the work himself, but they don’t have the extra money to buy the materials they need. “We just want Leon to feel like he has some independence, while also keeping him safe. We need to do it in a way that his older brother doesn’t feel like he is in a little boy’s room. We know we can do it, we just don’t have the funds to get started!” Sam said. The boys’ birthdays are early next year, and they would love to get the work finished by then. With your help, we would like to help give Leon and his big brother their new bedroom. 1. Donations towards materials: We need to buy wood and other building materials, paint, wallpaper, a blind and mattresses. If we raise more than is needed for the renovations, we will use any extra money to help Leon and his family in other ways, such as buying a video monitor to make sure Leon is safe during the night. To make a donation, please click the link below. 100% of what you give will be used to help this family. 2. Paint / Wallpaper: if any kind companies would be willing to provide the paint and wallpaper they need, please fill in the form below and let us know. 4. Messages: We would love to send Leon and his family some kind messages, offering encouragement for Leon - who has been an incredibly brave little boy - and support for his amazing mum and dad, who do so much to care for Leon and his siblings. Messages can be emailed to us by writing them in the form below (we will pass your message along, but not your contact details) or they can be posted to 52 Lives (Life # 182), PO Box 3154, Reading, RG1 9AT. Thank you so much - you never know how much difference a few kind words can make. - We received more than £220 in Amazon gifts and gift cards. - A wonderful woman called Alison, who is the head teacher at Hyde Heath Infants School, recently celebrated a big birthday and instead of asking for gifts, she held a ball and asked her friends to donate funds to 52 Lives. They raised an incredible £1700 and we will be using some of those funds to help us reach our final fundraising target for Leon. Thank you so much to Ali and all of her wonderful friends who donated. - A lovely lady called Sarah got in touch just before Christmas to offer some help for the family as well. She donated £100 Argos gift card, as well as £100 donation towards a gift card for groceries for the family, to help make their Christmas a little bit easier. I'll share some more photos and a message from the family once the building work is finished. Thank you so much everyone! When I told Leon's mum that they will be able to go ahead and start the renovations, she said "I am beaming! It's a long time since I have smiled so much.... thank you thank you thank you!"